Try a local favorite! The Matanuska Glacier is a frozen 27-mile long river of ancient ice. Thousands of years old, this massive glacier is tucked up into the head of the Matanuska Valley. You will spend over 2 hours directly on the glacier with a glacier guide by your side, learning how the Matanuska Glacier was born and how it shaped the landscape in the Matanuska Susitna Valley. Explore blue meltwater pools, the ice formations and deep crevasses. Walking on ice is slippery fun, so our guests are equipped with a helmet, a walking stick and crampons that attach to your shoes. We require our guests to bring sturdy footwear and suggest that you bring an extra pair of socks. Don't be surprised that your shoes get filthy with glacial flour. This glacial till is finely ground rock the glacier has created - it makes for great facials! Our fully-guided transportation includes a pick up at your hotel in Anchorage as well as water and snacks in the touring vehicle. 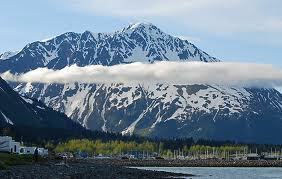 We will also stop for lunch where we’ll overlook the glacier while enjoying some yummy Alaskan fare. Pease note: This tour requires 2 hours of walking. We require guests to bring sturdy footwear and suggest bringing an extra pair of socks.